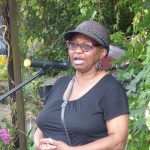 Waltham Forest Thuso in South Africa is a charity founded in 2006 by members of the North East London branch of ACTSA (successor to Anti-Apartheid). 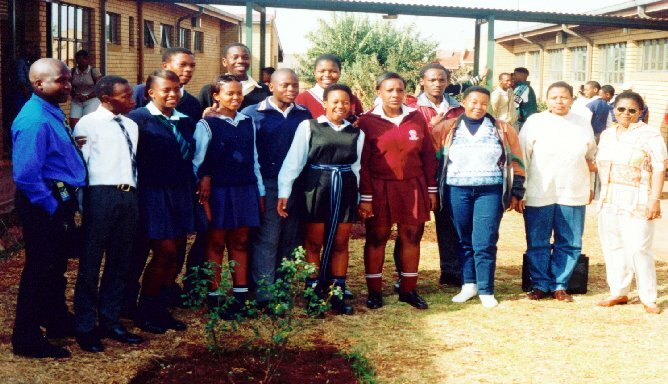 We share Nelson Mandela’s vision that the children of South Africa are the country’s greatest asset. Now in its fifth year, the Thuso sponsored cycle ride is set to raise money for solar lamps once again. Friends and supporters of the charity will be getting in the saddle on Sunday 9th September to bring safe and affordable lighting to pupils and their families at Lobethal primary school in rural Limpopo. Hundreds of lamps have already made their way to South Africa, as a result of the energetic efforts of cyclists in previous years. All 15 riders who participated in last year’s cycle ride completed the 40 mile course, which travelled into Epping Forest from Walthamstow to North Weald, via High Beech. In spite of challenges in the form of hills and punctures, the riders were encouraged by great weather and the lovely Essex countryside. Up to 40% of South Africans still use highly-flammable and toxic kerosene for heating, lighting and cooking. But the new generation of solar lights – like those we are sending – are cheap and reliable and can be used to charge phones as well as provide lighting. The lamps enable children to study after dark and provide a safe form of lighting when electricity supplies fail during power cuts. The families who have received the lights so far have found them easy to use and maintain. 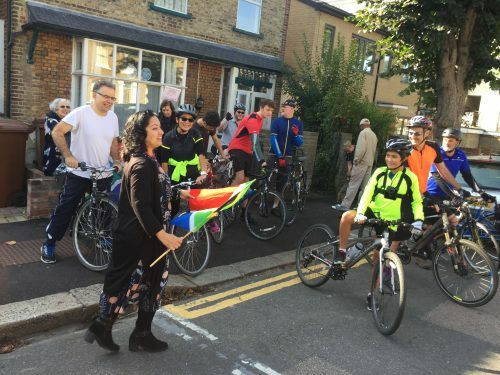 This year’s bike ride will set off from Walthamstow at 10am on Sunday 9th September and riders can choose to complete between 10 and 40 miles. This year we have a number of under 14s taking part in the 10 mile cycle and are keen to have more children, with their parents. For more information or to join the cycle ride contact Gerard on: gerardomastamilsom@yahoo.co.uk or 07931 337202. 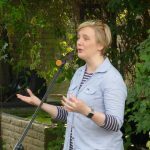 This year’s fundraising Garden Party was our best ever, raising more than £1,500. 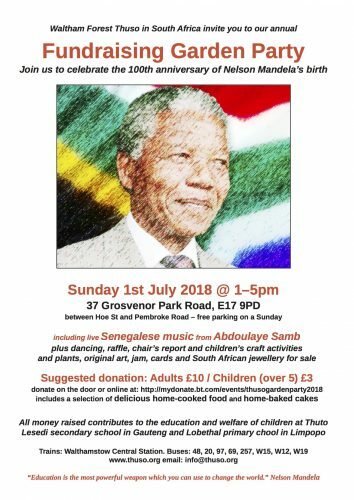 The glorious summer weather ensured that a crowd of supporters joined us to celebrate Mandela’s Centenary and raise money for schools in South Africa. We were serenaded by Senegalese musician Abdoulaye Samb and entertained by a showcase of dances from South Africa and around the world. 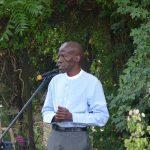 Guest speakers included South African Deputy High Commissioner Mr Golden Neswiswi, who praised the contribution of women in South Africa and more widely in the solidarity movement. 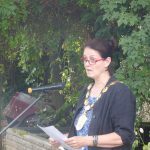 Mayor of Waltham Forest, Cllr Sally Littlejohn, and Stella Creasy MP also addressed the event, while Thuso’s Chair Mmapula Tiladi Small gave visitors an update on the charity’s work. 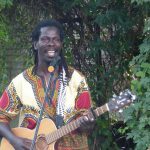 We are also delighted to be bringing you live music from Senegalese singer Abdoulaye Samb, and dancing and craft activities. Plus, with our usual sale of plants and crafts, and a delicious homemade lunch, this year’s event looks set to be our best ever. 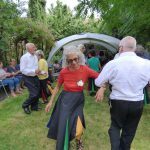 This year’s Annual Fundraising Garden Party is on 1st July at 37 Grosvenor Park Road, E17 9PD from 1-5pm. 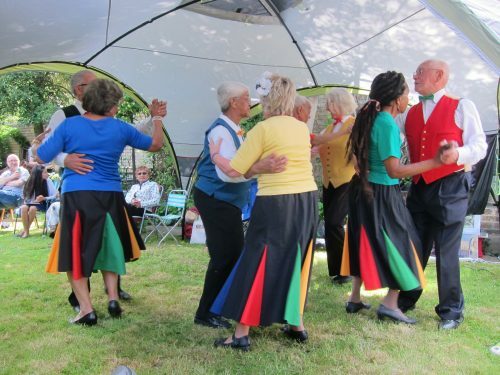 But we remain as happy as ever to take your generous contributions at the Garden Party itself.